On a recent visit to Rupavahini, I noticed something weird. Apart from the central TV at reception, the others (notably the ones in the makeup division and canteen) were tuned to Sirasa TV. 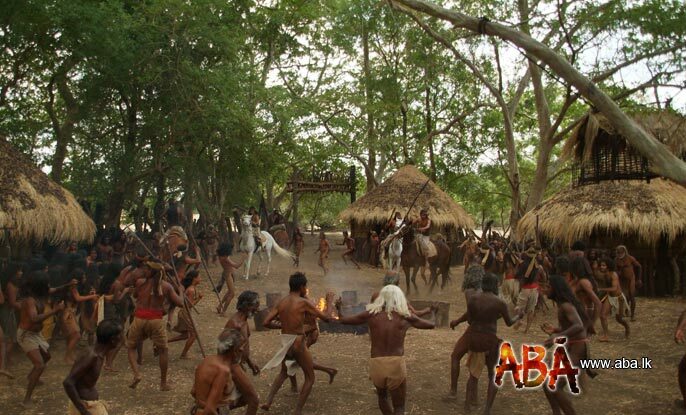 Oblivious to their own channel broadcasts, the employees of Rupavahini were blissfully glued to ‘Minisun Athara Minisek’ – a feature movie from Sirasa TV, with Gamini Fonseka playing the hero. This speaks volumes about Sirasa TV’s popularity. Use of one’s product by the very employees of main competitor’s is a rare achievement. It is like Pepsi Cola selling more at the canteen of Coca Cola employees. My congratulations go to Sirasa TV but let that not deviate me from my premonition, that Sirasa TV badly requires a re-strategizing exercise. It is almost overdue. I am certain Sirasa TV understands the two key components of the Sri Lankan Sinhala audience of the day. I prefer calling them Children of ’56 and ’77 respectively. Not that everyone belongs to these two groups – but they drive all of us from time to time. A little overlap might be possible but mostly they are two distinct forces. 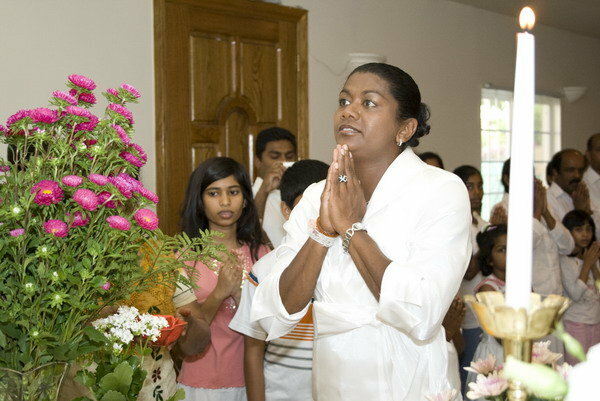 This is a largely Sinhalese Buddhist (a small percentage of Sinhalese Catholics/Christians) group. They represent the key force that brought the current government into power. They are eager to send their children to Dhamma schools on Sundays. They resist Western culture or anything even vaguely associated with it. They also do not tolerate any deviations from what they term as ‘Sinhalese Buddhist culture’, in reality a Victorian product. One may also call them the ‘local Taliban’. The post independent history of Lanka records several instances this force became prominent. The most recent one was in 2003, the aftermath of the death of Ven Soma thero, when it was powerful enough to make the reelect ion of an already unpopular government, of course under a different and more nationalistic leadership. This group might be smaller in size, but better not underestimate their strength. This group is larger in size and includes sections of lower middle class to semi-poor. (‘lower’ in social status, not necessarily income-wise) These have recently beaten poverty, mainly thanks to the socio economic developments in the post ’77 era by the UNP governments of J R Jayawardena and R Premadasa . Many of these families have someone working in Middle East or doing a small business of their own. 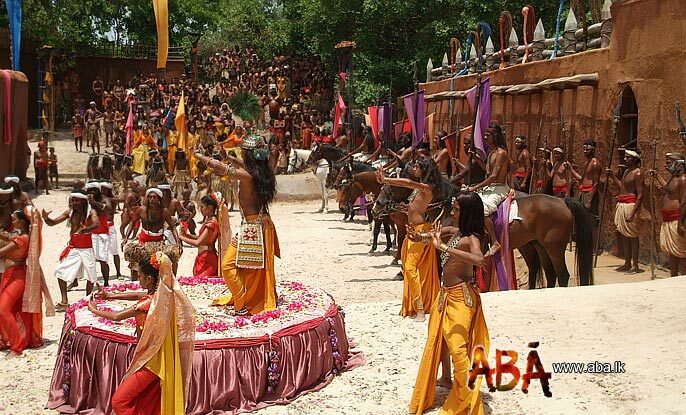 Their lives are uncomplicated and they look for simple entertainment. On an average basis their level of education may be lower compared to Group No 1. This is mainly an apolitical group but I am not surprised if majority still votes for the UNP. Apart from these two groups, there are others but they are too diversified to be treated as a third cluster. From its inception it was the second group that Sirasa TV focused. It was a wise decision. Both state channels focus on Group 1 so there was a huge vacuum for Sirasa TV to enter. Most of its popular programs (Sirasa Super star, Ran Depeya, Hina Ina, Kageda gee nada, Looks like, Sirasa Dancing Star, feature movies of popular actors/actresses) directly caters to children of 77 who like simple entertainment. Others have unsuccessfully tried capturing portion of its audience, but by default Sirasa TV still rules. On the other hand, there is no way Sirasa TV can ignore the first group. It would be too risky, both financially and politically. With the anti-govt image it has already earned not catering to the nationalistic audience would be suicidal. So what Sirasa TV does now it to insert special segments for children of ’56 into its schedule aimed mainly for children of ’77. That is how we hear monthly Buddhists sermons from temple trees, in the same channel that broadcasts bizarre dances of rural teenagers – one of the core items of criticism in such sermons! No need to say, this antagonises both groups. Who wants to watch something not customized for them? This largely explains the anti-Sirasa TV feelings of the day. A massive audience enjoys watching Sirasa TV but they are annoyed when some of its programs challenge their hardcoded value systems. The simple solutions of putting off the TV or changing channels are not available because they still want to watch it. (though they may not want to admit) This starts a special ‘love and hate’ relationship with the channel. That is why I think Sirasa TV needs to re-strategize/re-brand. This is the time to start another Sinhalese channel. (Sorry, I am not fully aware of financials or spectrum issues. I know this can be costly, but no idea how costly) They can be like ‘Palamuveni Sevaya’ and ‘Deveni Sevaya’ of the good ole SLBC. The first had more serious stuff while the second was commercially oriented. It was the second channel most listened to, but still if anybody wanted they had an option of more ‘advanced’ or ‘patriotic’ content. Finally both groups were satisfied. The danger of Sirasa TV not having a channel for less commercial serious stuff to cater children of 56 is them completely losing the credibility of the station. This, in fact, has already stared happening. That is what makes Sirasa TV the most hated TV channel. A little hostility is inevitable, but if that continues Sirasa TV needs to take it seriously. After all, even Mervin Silva is a prospective audience. There is no need to impose self barriers when expansion is still possible. 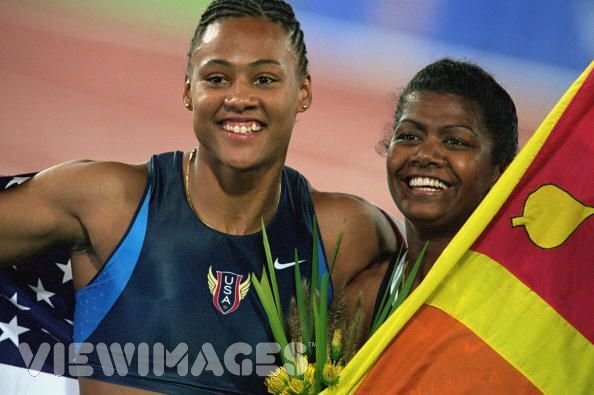 Susanthika Jayasinghe finished behind Marion Jones and Pauline Davis-Thompson in the Women’s 200 meters in 2000 Summer Olympics. In October 2007 Jones admitted taking performance enhancing drugs and was stripped of the gold medal. Sri Lankan sprinter Susanthika Jayasinghe advanced to the semi-finals of the women’s 200 m event at the Beijing Olympics today (Aug. 19th). Susanthika clocked 22.94 seconds to be placed third in the second heat of the second round, after Bahrain’s Al Gassra Roqaya (22.76 sec) and Hurtis Houairi Muriel of France (22.89 sec). Earlier in the day, running in heat one of round one, Susanthika timed 23.04 sec. to secure second place. The semi-finals will be worked off tomorrow. Susanthika Jayasinghe: Is our ‘black beauty’ ready for the swan song? Susanthika Jayasinghe and relatively little known Nadeeka Lakmali are the only remaining Sri Lankan competitors at Olympics 2008 at Beijing. They will take the field on Tuesday. We all wish the best for them – but let us admit – 2008 is no 2000. Eight years ago we all were sure Susie would bring a medal for us. This time not even the sports editors take her seriously. I checked four English weeklies today. Only Sunday Leader had a photograph of her – that too on the top of a brief two column piece. Boxer Anuruddha Ratnayake, Shuttler Thilini Jayasinghe, Shooter Edirisinghe Senanayake, Weightlifter Chinthana Vidanage, Swimmers Daniel Lee and Mayumi Raheem all were knocked out of the world’s biggest sporting spectacle without offering a fight and even without achieving a personal best barring Vidanage. Thirty three year old sprinter Jayasinghe is out of form and off colour this season, but remains the only distant hope for the country as she is capable of pulling off a shock at the most unexpected moment as she proved in winning an Olympic medal and two world championship medals in the women’s 200 metres. Lakmali would take part in the javelin throw and was the only other athlete from Sri Lanka to qualify for the Games.Though the athletes are fast making their exits, officials are still pouring in to Beijing from Sri Lanka. Susanthika Jayasinghe has already announced her retirement after the event. Intelligent decision. One should leave, they say, when others question why and why not. Sad to see somebody like Susanthika ending her career in this manner. After all, she was the only one who ever brought a medal (even though, a bronze) for us from Olympics after the days of Duncan White. Whatever said and done – we should be grateful to her for that. Having said that, I can only pity the loss to Sri Lanka. Having identified her talents and potential at young age, we could always support her to build her career. We could have supported her till she becomes the fastest female runner in the world. We didn’t do that. Instead we all made the life hell to her – poking fingers to her private life and giving her enough psychological issues. She was forced to keep her marriage as a secret for three years. She was exploited at the political platform in the dirtiest possible manner. She was cross questioned on national TV about her intimate affairs. In short, she was nothing but a pawn in a much bigger political game. Not that I say she was completely innocent. She herself has to take part of the blame, no doubt. Still what level of wisdom could we expect from her? She was just an immature youth – that too coming from a rural environment. My frank opinion is the others – kings, queens and bishops – involved in the game should have been more responsible. The bottom line is we lost one great opportunity to make the Sri Lankan mark on the world sports map. 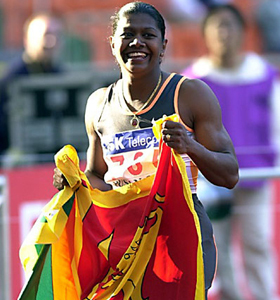 Susanthika Jayasinghe (born December 17, 1975 in Atnawala, Sri Lanka) is a sprint athlete specializing in the 100 and 200 metres. Brought up in a poor family in a small village 60 kilometres north of Colombo, where running spikes cost more than the average month’s wage, Susanthika had no access to proper sports equipment or coaches. Yet in spite of these underprivileged conditions she managed to progress to a standard where she could claim medals at both the Summer Olympics and IAAF World Championships in Athletics. After her performance in 1997 at the IAAF World Championships she travelled to the United States of America to train. Along with Dhamyanthi Dharsha and Sugath Tillakaratne her athletics performances have lifted Sri Lanka to the international competitive level. In 2000 she became the nation’s first Olympic Games medalist since 1948, when she finished behind Marion Jones and Pauline Davis-Thompson in the Women’s 200 meters. On October 5, 2007 Marion Jones admitted to having been taking performance enhancing drugs prior to the 2000 Summer Olympics. The International Olympic Committee has stripped Jones of her medals. However, the redistribution of the medals will be decided in a forthcoming meeting. However, Susanthika has been embroiled in controversy most of her career. She was suspended from competition in April 1998 for failing a drug test that she claimed was rigged due to her political beliefs and a falling out with a Sports Ministry official. She was later cleared of the offense. After returning home with her Olympic medal she was attacked by a male athlete because, she believed, she had been supporting former government members in an election campaign. With no support from her national athletics association she had to go heavily into debt to even reach the 2000 Olympics but after her medal achievement there she was supported by a national fundraising drive in her homeland. In spite of that she left her home country to live in Los Angeles. She currently lives, however, in Sri Lanka. She recently visited Los Angeles to train with Nagalingam Ethirveerasingam (Asian Games Gold Medalist in high jump – 1958; and two time Olympian in high jump – 1952 and 1956). Shortly thereafter, she won gold medals in the 100 m and 200 m at the Asian Athletics championships 2007 in Jordan a bronze medal for the 200 m race at the IAAF World Championships 2007. It was her first world championship medal in 10 years. She is currently ranked by the IAAF (as of 13th August 2007) 18th in the world for the 100 m sprint and 20th in the world for the 200 m sprint. 1. English language skills of rural youth are miserably low: A myth. 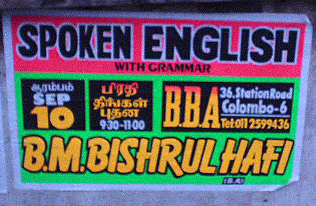 Vast majority of Sri Lankan youth now, irrespective of their origins, can understand basic English well. However, they may be poor in expressing themselves. Not a surprise, because they do not get sufficient opportunities to do so. In the right environment, most such cases can be addressed with minimal coaching. 2. No modes are available for rural students to improve their English: Not true anymore. According to the latest consumer finance survey by Central Bank, TV penetrates 71% households while radio covers 78%. Both these media broadcast enough English programmes. 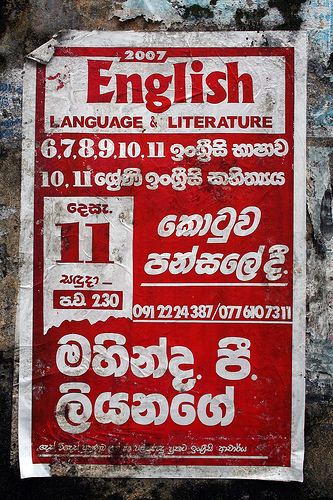 Sri Lanka has six English weeklies and three dailies. English is a core subject in primary and secondary education – even in schools in the most remote parts of the island. There is still room for improvement, but only for creating interaction. 4. Good English knowledge is a must for a job in private sector: Not always. Advanced English is not expected at the entry level. Most such positions need nothing more than ability to understand and speak simple English. Filling a form demonstrates sufficient written skills. Anywhere in private sector, enough ‘on-the-job’ training opportunities exist, and once in, they can improve. 5. What bars rural youth from private sector is ‘kaduva’ (and may be IT skills): Not necessarily. Having interviewed hundreds of applicants for entry level jobs I do not remember even a single case where the lack of English knowledge was the only (or even primary) reason. Risk aversion and poor attitude count for more failures. I have recruited at least one with questionable English knowledge but exemplary technical skills. He was a fast learner. After less than 3 years in that position he now works in a better position in Middle East. 6. English can drastically improve the marketability of rural youth: Again not always. English adds value but it per se does not. Most of the entry level jobs in private sector require some sort of technical skills. For example when the opening is for an Accounts Trainee, pure language skills will not land anybody there. A CIMA part 2 or even 1 might be a better qualification. 7. English should be taught/learnt in a class room: This might be the biggest myth. Why teach language in a class room? Is that the only possible environment? Why not use books? Radio? TV? Cassette? CDs? English movies in DVDs? Internet? Blogs? Will not Steven Spielberg be more effective than Wren and Martin? Why follow same obsolete methods used in the pre-technical era? Why ignore the power of technology? During the colonial times state played the role of the tutor. It produced English educated administrators because dependency on Madras government was too costly. 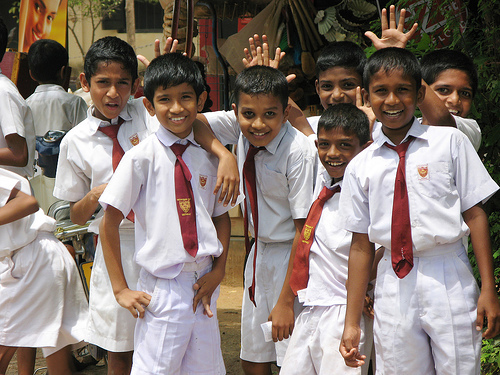 In fact, the primary objective of creating Colombo Academy – now Royal College – was just that. However, times have changed. Today government operates largely in vernacular and faces no dearth of human resources. If at all English is valued, it is by the private sector. So why should the government spend tax payers money to create personnel for private entities? Even if state sees from the angle of addressing the issue of unemployment by minimizing the demand and supply mismatches, taking a holistic approach in building vocational skills rather than focus only in English would be more sensible. Still if someone thinks it is state’s dire obligation to make rural youth armed with Queen’s the best is to use an informal approach. Adding extra slots to time tables will not do. Education reforms might help, but it is a long term solution. What would be more practical is to introduce some job oriented English teaching programme on TV; or to do some CDs. Need interaction? May be Internet or if not residential crash courses. Anything but typical classroom teaching within school/university curricula. Use technology generously. Teach English not as a language per se but as a life skill. (eg Ability to self learn a software using help functions is more important than to read Treasure Island) Not that these would make rural youth Shakespeareans. Neither that per se will position them in private sector overnight. Still it would make the gap less. It might even make few ex-Marxist economists, those who are so worried about inequality, happy.